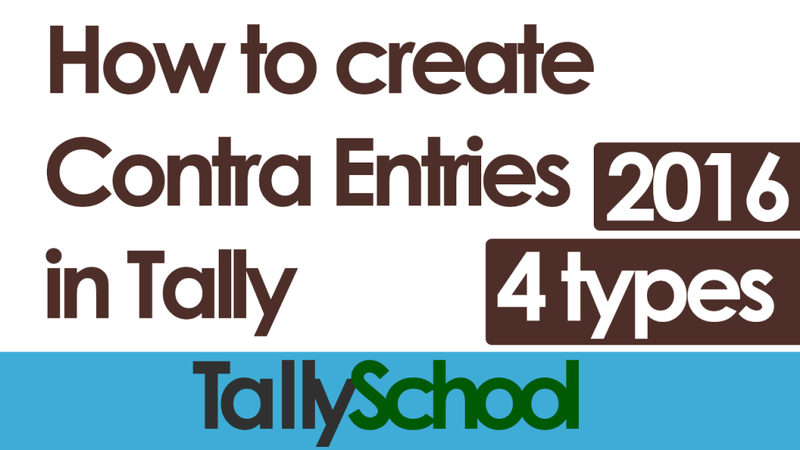 Before explaining “How to Create Contra Entries in Tally”, let me explain you what is actually a contra entry. In double entry accounting system, contra entry refers to an accounting entry which involves transfers between cash accounts and bank accounts or between different bank accounts. From Bank account to Cash account – This means when you are withdrawing money from bank such as ATM withdrawal for daily expenses or withdrawing big amount of cash for business or personal purposes. The accounting entry for this transaction will be a contra entry. From Cash account to Bank Account- This is the exact opposite of the above transaction. When you deposit money in bank, its accounting entry will be a contra entry. From Bank account to another Bank account – It is common to have more than one bank account in business or for personal use. When you transfer your money from one bank account to another bank account, its accounting entry will be a contra entry. From Cash account to another Cash account – This happened in old times where there were no commercial banks or proper banking channels and people usually did all the business in cash. In that old times, some businesses have different branches. When cash was transferred from one branch to another, that will be a contra entry for accounting purposes. Although now a days, it is not prevalent and almost all business dealings are done through banking channels. I will show you a step by step process by following which you can easily create contra entries in Tally for all the transactions which I described above. Let’s start with the first one which is the contra entry for Bank Account to Cash Account. For this entry you will need to create 2 ledgers namely, Bank Account and Cash Account. Very few people know that the ledger for Cash Account is already pre-created by Tally. So you don’t have to create another Cash Account. In this post, you will only have to create a Bank Account. Now, to create a contra entry for Bank Account to Cash Account, go to Accounting Vouchers, from Gateway of Tally. Select Contra from the right hand green colored sidebar as shown in picture below or just press F4 which is the shortcut for contra voucher in Tally. A white screen will appear for creating contra voucher entry in Tally. You need to create the contra entry in as shown in the picture. This is how a contra entry for transferring money from a Bank Account to Cash Account is created in Tally. In simple words, this entry says that I withdrew Rs.500 from my Bank Account. As soon as I withdrew it, it becomes cash therefore second account is Cash. Let’s move on to the next contra entry which is opposite of what I created just above. In this entry we are depositing cash in the bank. Therefore the entry will be as under. In the contra entry, I have transferred or deposited Rs.500 in the Bank. When we transfer money from one of our bank accounts to another bank account, this contra entry is required. If you have more than two bank accounts and you transfer money in between them, then the accounting entry will be as described above. I have already said at the beginning of this post that this kind of transactions are now a days not occur in most businesses. But still as it is a form of a contra entry, I would like to cover it here. Imagine if your business has two branches in the same city and you transfer cash from one branch to another branch, the entry will be as shown in the picture below. Click the image to see it clear. These are the contra entries that are most widely used in any business or for personal accounting purposes. Actual meaning of contra is opposite or against something. If I construe the meaning of contra in accounting, it means money transferred from one form to its opposite form. For example, transferring money from bank to another bank or cash to bank. They are exact opposite. Hence the name contra entry. If you have any questions or suggestions, comment down below and I’ll be happy to answer them all. This generally does not happen today because of banks. But still I’ve explained about transfers between Cash Account to another Cash Account in the post. You can go through it and you will easily understand it. Why we don’t paas entry of goods in tally? Who said we do not pass entry of goods in Tally. We pass a purchase entry for that. First of all, when you deposit or withdraw money from bank, you need to pass a Contra entry and not journal entry. And, yes you can change the amount. You can learn to create ledgers with the help of this tutorial. Hi I am very much interested to learn Tally ERP can you provide link or ebook regarding the same. You can learn about the books on Tally on this page. please let me if you have DVD, & price. How i get full knowlede of tally. And by learning it from TallySchool too. 1. what are the process to remove difference in opening balance in balance sheet? Check your opening balance sheet figures once again and you will find the difference. Adjustment depends upon where the difference is. but how check opening balance sheet figures in tally ERP 9 to find difference. Press ALT+F2 and select the opening date in both the from and to options. Now check on which side the difference is. Compare it to the balance sheet you have. If you don’t have any balance sheet, just write down the figures on a paper and you’ll know the difference. mne bank account(current a/c) open kia h. use open krn k ly mne apne personal account m se trasfer kie h pese. to ye cash to h ni jo m bank dr. to cash cr. se entry dikha du. to iski qa entry honi chaie or uska under head qa dalu. Apne jo bola ha uske hisab se ye entry hogi. Dono me hi under head bank accounts hi hoga. You can enter your personal bank account while entering entry in Tally. When you are showing personal account, you can show personal bank account as it is with all the expenses. MAIN KON SA VOUCHER KATEGA..
Voucher type will be receipt entry and vouchers will be cash and capital accounts. There is no need to create cash ledger as it is already created in Tally by default. Duplicate error shows when you try to create ledger which is already created. Check your ledger list and you will find the mistake. so i just time before joined on your telly school i learned the things one thing which i not getting is that suppose i have an account ,then credit means the amount enters in my account and debit is that what i give to other one from my account so here something different i found,so why this will get change during working on telly. In contra entry the logic is same. But you are seeing it from a bank passbook view. In accounts, the things are opposite of it. I recommend you learn basic accounting from the Basic Accounting Course on TallySchool. when we have transfer fund from one bank account to another bank account bank charges NEFT charges in this case bank charges ledger not shown during contra entry. For this kind of situation, you have to pass another entry as a payment entry. GO through the Basic Accounting Course as you will need to familiarize with accounting basics first. Then, start the Free Tally Course Online. That will make you better at Tally than most of the people out there. There will be two entries then. You should check out the Free Basic Accounting Course if you are struggling with Basics of Accounting. I am Sudarshan , what to do when sundry debtors showing cr balance , and sundry creditors showing dr balance , and how to adjust them ..
Change Sundry Debtors to Sundry Creditors because if it is showing credit balance, it is now the creditor. Same is to be done to the Sundry Creditors. Hi Rishit sir, I’m totally new. I want learn. How many days I can learn. And what type of education I can do and from where. Start from Free Tally Course and then watch all other videos. By this way, you will learn a lot. For advanced study, you buy my DVD. Direct Expense means anything that is directly spent for a business. For example, salaries, daily expenses like electricity bills, phone bills and so on. Indirect expenses are expenses that are not directly related to the business but indirectly related to it. Such as political contribution to any party, donations and so on. It all really depends upon a business whether an expense should be direct or indirect. cash deposited to bank ,which is a loan.what will be the entry? Cash deposit to bank entry will always be same. put only relevant bank entries– sans personal exenses etc. It works fine . The funny part is all the bank entry is verified because of the bank statements , but in the end the cash account never shows the reality. Always it shows more. Every months I put the difference amount between the actual & amount shown – as adujtment / enter in drawings. Please help. You must be passing some less entries in the cash account or there must be something in bank reconciliation. If it is showing more, check all the entries. Then check all the bank entries and see the effects of them are being passed right. If all things are good, there should not be any difference. IS A TRANSFER OF MONEY FROM A BANK ACCOUNT TO PETTY CASH ACCOUNT A CONTRA ENTRY IN TALLY? Yes, it is a contra entry. It does not affect the balance sheet at all. Only the amount gets transferred from one bank to another. You can use contra whenever there is an involvement of only cash and bank accounts. You can use it as many ways as you want. Hello sir , i want to learn tally erp9 for only own business. I shall apply gst no. After learning tally and I can maintain own business in tally. And I want to file gst return himself. Can you send me learning step one by one. You can maintain your own business in Tally. But to be sure, can I know what kind of business you are in? Secondly, I would not recommend you filing GST returns by yourself because a single mistake can cost you big money. You can learn Tally by going through Free Tally Course Online. how to create ledger in voucher entry ???? To create ledger in voucher entry, you have to press ALT+C wherever you want to create a ledger while passing the entry. I have already described the GST lessons. It would be payment since you are transgerring from your bank account to your mother’s bank account. But right side your tally video shows “Dr Cr ” but my tally shows “Amount”,what is wrong with my tally? You have to disable the single entry option for that. Now, go to Voucher Entry. Now, set the option of Single Entry Mode to No. Also, set the option of Dr/Cr to Yes. sir mere cash in hand account me cash credit side dikha rahi hai..me bank ki cash ki entry contra me karti hu..it is right? Cash credit side dikha raha kyuki aapki cash ka negative balance hai. Bank or cash ki entry contra me hi hoti hai. Cash deposit entry in Bank will always be in Contra Voucher and not Sales Voucher. Agar aap ek bank se doosre bank me transfer karte ho to Tally me entry dono hi bank account me add hogi. You have to do a contra entry for that in Tally. Suppose, you transfered ₹10,000 from Bank 1 to Bank 2.